Al-Ain Tuesday saw off Argentina’s giant River Plate in the semi-final of the FIFA Club World Cup ongoing in the UAE, in penalty shootout, 5-4, to book their place in the final against either Spain’s super club Real Madrid or the Asian champions, Kashima Antlers. Al-Ain club stunned the Copa Libertadores reigning champions with an early goal, 3rd minute, from Swedish striker Marcus Berg heading in a corner from Ahmad Barman. 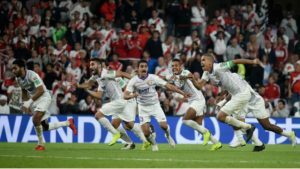 The Southern American team answered back with two goals in the 11th and 16th minutes from the boots of Santos Borre, the Columbian striker of the side coached by the former Argentinian international, Marcelo Gallardo. The 22,000 fans in the Hazza bin Zayed Stadium in Al-Ain who were largely for the Emiratis, were revived in the 51sth minute after Brazilian midfielder Caio netted a right-footed shot, to level the score, 2-2. The local team had to wait until penalty shootout to make history, after extra time. Goalkeeper, Khalid Eissa gave the win to his team when he stopped Enzo Perez’s shot after all five Emiratis managed to net their shots. The Emirati will play in the final either Real Madrid or Japanese side Kashima Antlers, on Saturday. Both teams are locking horns today for the second semi-final. Written by: Jaber Ali on December 19, 2018. Posted by Jaber Ali on Dec 19 2018. Filed under Gulf News, Headlines. You can follow any responses to this entry through the RSS 2.0. Both comments and pings are currently closed.